Most approaches to the global cyber security problem are usually focused locally inside separate organisations, who struggle to look out across the global landscape and effectively respond. National responses from government capabilities can be challenged by capacity and jurisdiction to truly understand the global threat environment, and to effectively respond. 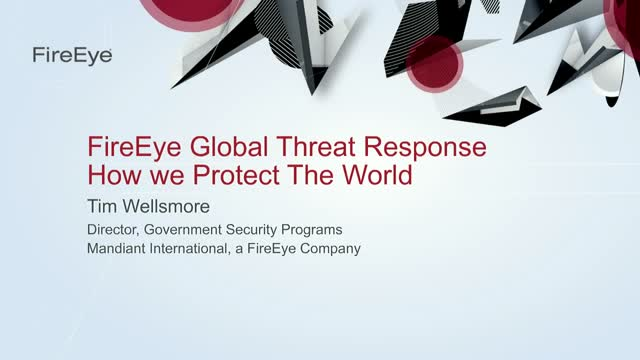 This presentation will highlight how FireEye utilises its various capabilities and threat focused teams from all parts of the business to build a cohesive global detection and response capability for the biggest global threats. This presentation will outline how we tactically respond within our internal capability teams, and across our customer base of 67 countries and how we keep the media, our customers and our government partners informed on the latest information. How we scale quickly to respond to WannaCry or NotPetya to ensure our Community Protection mandate is relentless maintained is an impressive story. This presentation will highlight how our FireEye technology arm and FireEye's subsidiary companies of Mandiant and iSight work seamlessly together in a global cyber threat event to bring our best against the world's most advanced cyber threat actors.